LOCATION: Street Kitchen, Broadgate Circle, EC2M 2BY [map]. This place also has one of those posho air stream van things nearby but that’s not where I went. The actual shop is about ten feet to the right. PRICE: Various, see website for menu and prices. 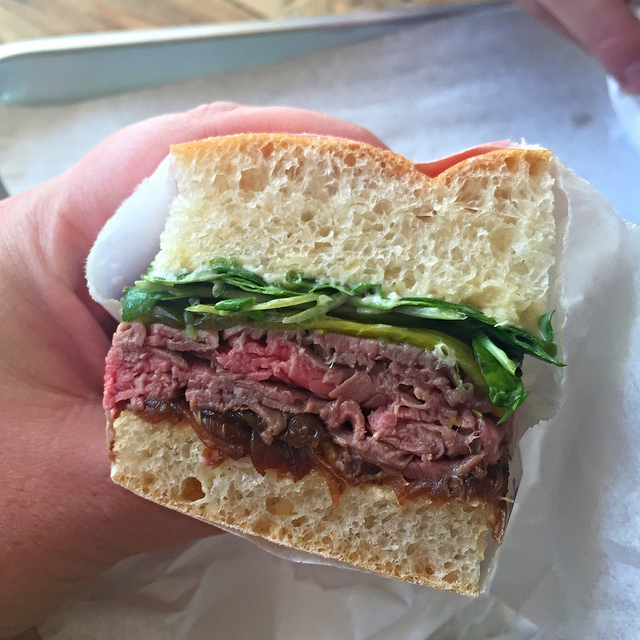 FILLING: Rare roast beef, caramelised onions, horseradish mayo, salad leaves. PROS: Street Kitchen sell sandwiches by the inch, which sounds like a swizz until you realise that they might only be an inch in width, but the length is very substantial. Arf. Or is it the other way around? Anyway, the sandwich is rare roast beef in a whacking great ciabatta bun, which they’ve had made by someone on spec. It’s quite hard to find two foot long ciabattas, apparently. The excellent meat is from a Welsh farmer called Tom Jones (yes really), and it’s very thinly sliced, then layered up like pastrami. This gives the sandwich a very satisfying texture, making it tender and easy to eat. There’s some carefully layered leafage, horseradish mayo and caramelised onions which I normally CAN’T STAND *goats’ cheese tart flashbacks* but in this case I think they work. I suspect this is all down to their attention to detail. I spoke with the owner of Street Kitchen, Mark Jankel, and so I know that this is a man dedicated to the sandwich cause. They get their ingredients from many different suppliers, because they know that the best quality stuff cannot be consistently supplied by the same source; there just isn’t enough of it to go around. They circumnavigate the problem to ensure standards remain high. I was super impressed by this. I think they love sandwiches as much as I do. Okay maybe not that much. No one else loves them that much, right? I shall give you another example of loveliness: the salmon bap. This juicy arrangement consists of Loch Duart salmon, just cooked, so it’s still a little wibbly. Over cooked salmon is a disgusting, mushy abomination. There’s beetroot, which doesn’t have even a hint of the granny sandwich about it, because it’s sliced so thinly and carefully stacked. There’s watercress, there’s home made mayo. No Hellman’s for Street Kitchen (although I am a big fan, in general). Like I told you, the devil is in the detail. CONS: Well, it’s in the soul sucking suit-pit that is Broadgate Circle, which is a shame. There’s also a Yauatcha and a Franco Manca, so it’s not like the place is full of Pret and EAT, it’s just a weird corporate space, which is privately owned, I think, so it’s full of security guards. Anyway, that isn’t Street Kitchen’s fault, obviously, and they have plans to roll out further sites (there’s another in Battersea already). What I’m saying is, don’t let the prospect of eating amongst the T M Lewin shirted rat racers put you off. Unless you are one, in which case you’re lucky because you have a really sweet place to buy lunch.